Without a doubt, meeting at a table makes a difference. It levels the playing field and gives everyone the same view. After all, Sir Arthur’s knights sat a round table on purpose. If you ever gather your co-workers or clients for a meeting you need a conference table and chairs that give you the space to set up your notebook (the paper or electronic kind), laptop, or tablet so that you have all the tools for full participation. So what makes for good conference tables and chairs? FIRST, CONSIDER YOUR SPACE. A conference table should be substantial. Don’t be shy. Typically, a conference table is at least 36” wide but can go wider – up to 60” is not uncommon. The primary consideration must be the size of the room. While you want a conference table that can give participants adequate elbow room, you also want to make sure to not overcrowd the space. A good rule of thumb is to allow 42” – 48” of floor space around a conference table for adequate traffic flow and comfort. NEXT, THINK ABOUT STYLE. Furniture is an art form and conference tables are no exception. While high-end colors and patterns may be just what you are looking for, those on a more modest budgets also have a huge number of choices. Wood substrate cores with laminate tops are economical, durable and attractive. From there, the sky’s the limit. Solid wood, glass, veneered, or laminate – conference table can be customized in about any combination of finishes, shapes or sizes. Racetrack shaped tables tend to be a practical solution since the rounded corners add to the level playing field without demanding the space of a fully round table. 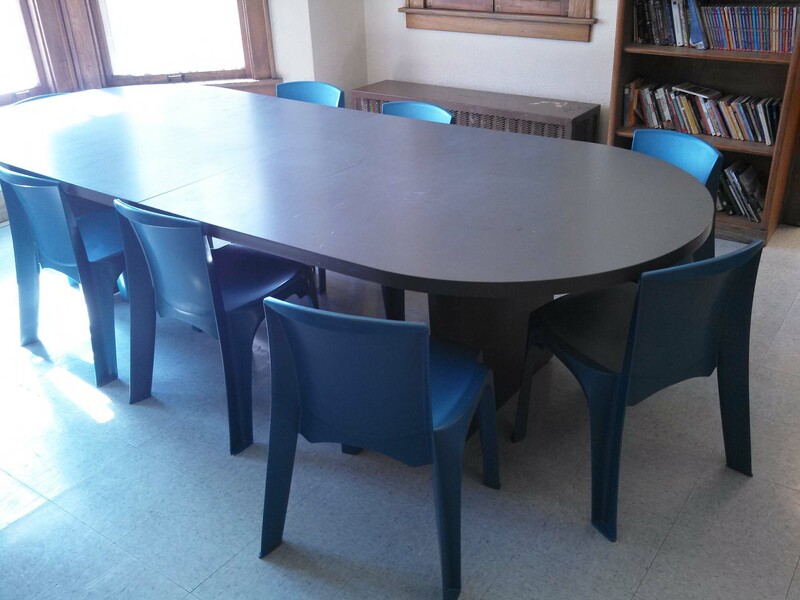 Yes, there is a lot to consider when buying a conference table and chairs. Always consult with a contract furniture expert who will gladly help you pick the right table for your space with no fees. While on-line only shopping is tempting, conference room furniture needs careful planning to get the right results. © 2016 - Furniture Concepts LLC. All Rights Reserved.